Dierks Bentley’s Up On The Ridge tour closed at the Ryman Auditorium in Nashville on May 22 after visiting 24 cities in 30 days to build demand for the album’s release on June 8. The final show featured Bentley’s backing band the Travelin’ McCourys and the Punch Brothers with Chris Thile (Nickel Creek) on mandolin and was filmed for a TV special that Bentley told the crowd was for GAC and PBS. Texan Hayes Carll opened the show. The sold out crowd included industry notables such as ASCAP’s Tim DuBois, Bentley manager Ken Levitan and songwriter Matraca Berg. Mike Dungan, head of Bentley’s label was perched attentively in the balcony. Early in the show the artist dedicated a song to his Mom, apparently not realizing that only moments before the show began she had left the Ryman with her husband, Dierk’s father, who was carried out on a stretcher by emergency medics. He appeared alert and was talking with the medics as he was leaving. MusicRow wishes him a speedy recovery. Bentley described his show and upcoming album as an “experiment” mixing bluegrass and country music. However, he warned the crowd, “If you don’t like the banjo you might be in the wrong place.” True to his word, the evening’s musical recipe, was heavy on the bluegrass, a joyful tribute to stringed instruments. Ryman acoustics were superb and the instrumental setting was effective in adding a unique perspective to the singer’s previous hits such as “Feel That Fire,” “Free And Easy (Down The Road I Go),” “Sideways,” “Come A Little Closer” and others. 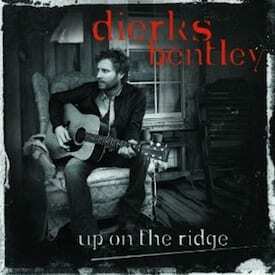 The video for Bentley’s first single from the new package, “Up On The Ridge” is already in heavy rotation on CMT and No. 22 rising on the MusicRow Breakout chart. Special guest Jon Randall joined Bentley to perform their co-write “Draw Me A Map,” from the upcoming album. Another of the evening’s high points was when McCoury band leader Del McCoury treated the crowd to his piercing tenor harmonies getting a standing ovation. Bentley told the crowd, “Bluegrass is all about the three ‘Ts’—tuning, timing and tone.” Judging by the evenings exalted musicianship, this writer will attest to the finely honed tuning and tone that has already seduced national critics from the Washington Post and USA Today. As to the timing, it remains to be seen how strongly Bentley’s fans will embrace this left of center musical experiment. Based upon the Ryman reaction however, the new album will serve as a vehicle to introduce Bluegrass to thousands of fans who have not been exposed to it and give fans added respect for the breadth of Bentley’s daring artistry.